April is National Poetry Month. 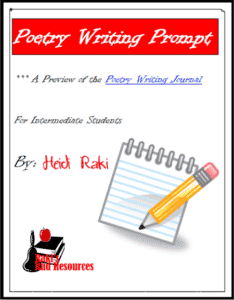 This Poetry Writing Prompt helps students relate the writing process that they use with all other genres to poetry writing, which can be much more challenging. Poetry writing is harder for your students who are used to following the rules, so this writing prompt helps them to bridge the gap. Download this free writing prompt from my Teachers Pay Teachers store. « Just How Big Was Paul Bunyan?